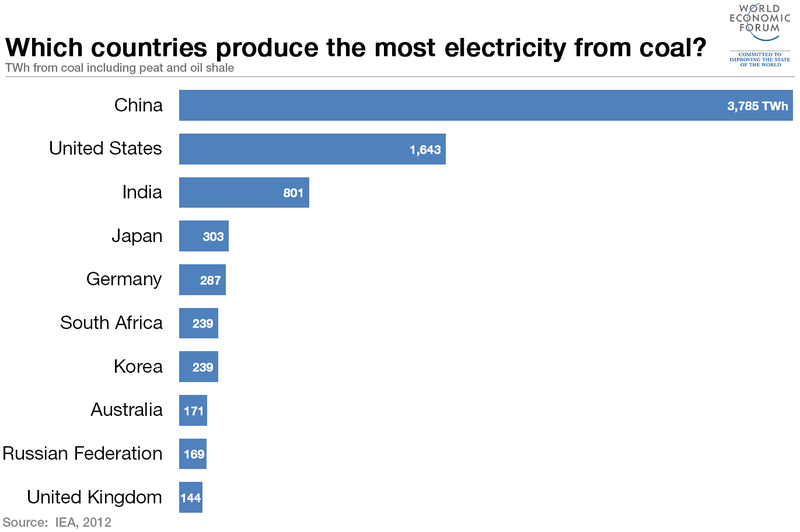 Which countries produce the most electricity from coal? As the world prepares for the Paris climate change talks later this year, moving to renewable sources of energy is a key part of many countries’ plans to reduce greenhouse gas emissions. However, in 2012, 40.4% of all electricity production worldwide still came from coal. China produces the most electricity from coal by a long margin – 3,785 TWh, more than twice as much as the US in second place. India, Japan and Germany complete the top five. This data is taken from the IEA’s Key World Energy Statistics 2014 and includes electricity generated from peat and oil shale as well as coal. What is the future of electricity? How can China reduce its coal consumption? Are renewables cheaper than fossil fuels?